There are tons of obscure television channels available on cable and satellite dishes. Well, here’s a listing for The Crocheting Channel. Happy Hooking! Our intrepid staff here at the Bucket has discovered an old photo that shows that Lt. John Pike, the UC-Davis cop who pepper sprayed a group of Occupy Wall Street protestors, comes from a long line of protest busters. 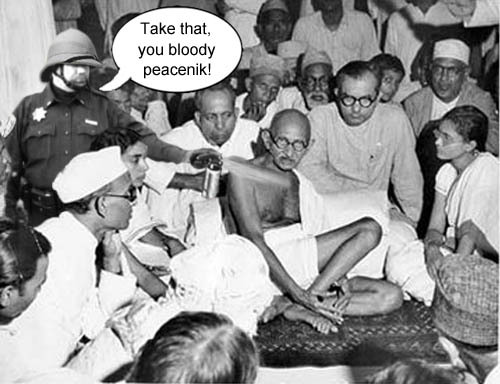 Lt. John Pike's grandfather, Nigel Winston Pike, who served in the British colonial police force in India, is shown reprimanding that notorious street thug, Mahatma Gandhi. Fox News, a.k.a. the Republican Propaganda Network, shows why they are so…eh-hem… respected in the world of journalism. Fair and unbalanced reporting at it’s finest folks! Fox News shows why they are the epitome of journalistic integrity with their stunning analysis of the Occupy Wall Street protesters. With the spate of recent updates on the Snow White and the Seven Dwarfs story, such as Once Upon a Time on television and Snow White and the Huntsman in theaters, we thought we’d present the list of rejected names for the original dwarfs. Just imagine what could have been! Who sez Dubya didn’t like to read when he was presidentin’? Although My Pet Goat was probably his favorite, he loved to read other books and here’s proof in a photo-toon from our November 20, 2003 issue. 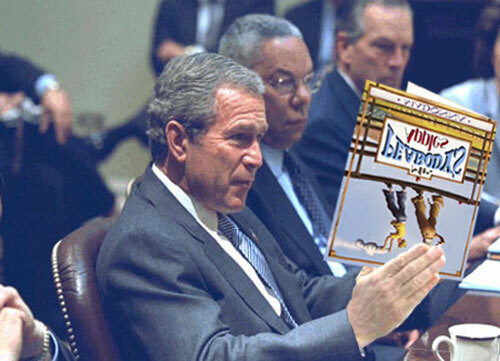 President Bush takes a break during a cabinet meeting to read Madonna's latest book, Mr. Peabody's Apples. 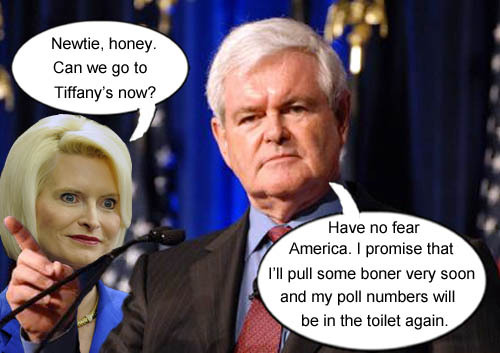 According to new polls, the new GOP flavor of the month is Newtie Fruitie Gingrich. Gingrich? Really? Haven’t we been down this path before? No matter, the laughs just keeps on coming! The Republicans just don’t want to pick Mitt(Spiff) Romney do they. But we have no doubt that Newtie will do or say something stupid to deflate his poll numbers again. Hmmmm, if Mr. Conservative Family Values makes it to the White House do you think he’ll dump the Snow Queen and get a new trophy wife? He’s got a track record folks. Just sayin’. 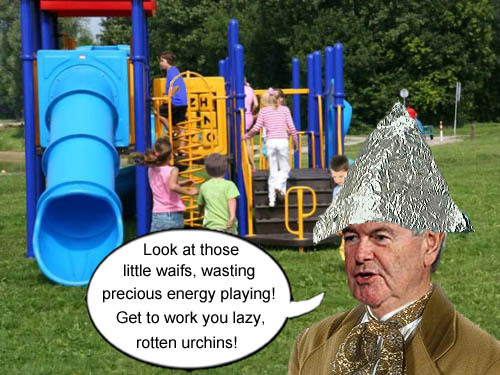 GOP conservative candidate Newt Gingrich assures America that the only surge he'll make is into Tiffany's. There are tons of obscure television channels available on cable and satellite dishes. Well, here’s a listing for The Chess Channel. Embrace your inner nerd and give it a watch. Rick Perry’s debate brain fart is now the biggest story in Con-a-thon 2012, replacing Herman Cain’s sexual harassment allegations as top fodder for political pundits. The laughs just keep on coming! 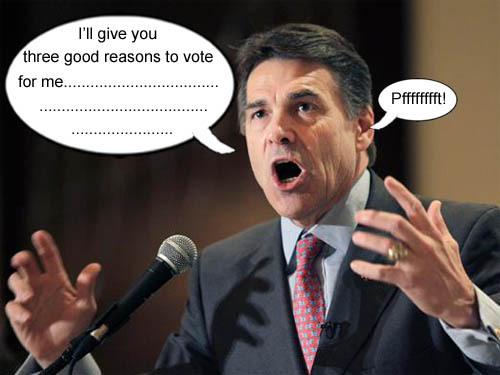 GOP candidate Rick Perry is still trying to come up with reasons why anyone would want to vote for him.